7.-8. Jūnijā mums būs iespēja ieskatīties tango Itāļu gaumē ar slaveno DJju un tango pasniedzēju Luka Lamberti – gan milongas mūzikas virtuvē, gan dejošanas mentālajos un tehniskajos aspektos. Paredzētas nodarbības dīdžejiem, dejošanas muzikalitātei un līderu prātam un jūtām, protams, milonga ar lielisku mūziku un vēl kāds pārsteigums. Nodarbības būs par pieņemamām cenām, pateicoties Eiropas Komisijas Kultūras un Izglītības aģentūras atlīdzībai! Visā pasaulē pazīstams Itāļu tango vīriešu smalkums, skaistums un īsts džentelmeniskums tango un arī ārpus tā. Ne velti Itālijā tango dejo katrā ciematā, labākie tango komponisti ir Itāļu izcelsmes, ar iedzimtu muzikalitāti un labu gaumi! Nu mums būs, ko baudīt! 7-8 июня у нас будет возможность приобщиться к итальянскому танго – вместе с известнейшим DJ и преподавателем Лукой Ламберти – заглянуть на настоящую DJ-скую кухню, узнать об эмоциональных и технических аспектах танца в лучшем итальянском стиле. Мы запланировали урок для DJев, урок по музыкальности танца, урок «чувства и разум лидеров», разумеется, милонгу с прекрасной музыкой и, возможно, какой-нибудь сюрприз. Цены занятий доступные – благодаря гранту Европейской Комиссии по культуре и образованию. Весь танго мир знает, что итальянцы – самые элегантные и лучшие танцоры и джентельмены на танцполе и за его пределами. Недаром в Италии танго танцуют тысячи людей, практически в каждом городке, лучшие композиторы танго – итальянского происхождения, все это благодаря особой музыкальности и чувству прекрасного, свойственным этому народу. Предвкушаем море удовольствия! On June 7th-8th we have the opportunity to look into Italian taste tango with famous DJ and tango teacher Luca Lamberti – into milonga music cuisine and into mental and technical aspects of Italian style dancing. The event plan includes a class for DJs, lessons for dancing musicality and leader’s embrace, mind and heart, then – of course – a milonga with super-music and also some surprise. The lessons’ prices will be affordable thanks to European Commission Culture&Education agency sponsorship. The whole world recognizes Italian tango men as the finest and most beautiful leaders, and real gentlemen in tango and afield! In Italy people dance tango in every village, the best tango composers always have Italian roots – all thanks to innate musicality and passion for beauty. Well, we are going to have something to enjoy! If there is no rain! Italian wines selection with 25% discount! 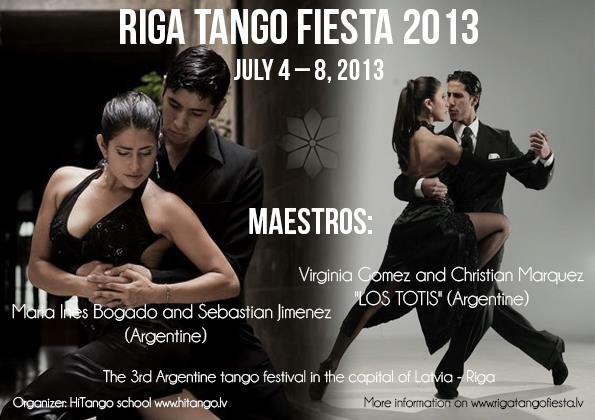 We cordially invite you dear tangueros and tangueras to the 3th anual Argentine tango festival in Riga – RIGA TANGO FIESTA 2013 on July 4 – 8, 2013.
an Argentine tango school HiTango (www.hitango.lv), that is developed on the basis of the Center of Culture and Sports “HiCentrs” (www.hicentrs.lv). 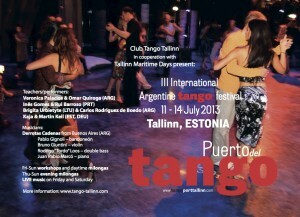 July 11-14 Tallinn, TANGO PORT TALLINN (Estonia)! It’s great to have 2 festivals side by side! For the 3rd time already Tango Port Tallinn invites you to different places near the port as well the famous Old Town of Tallinn – a city that hides thousands of secrets in its romantic medieval heart. 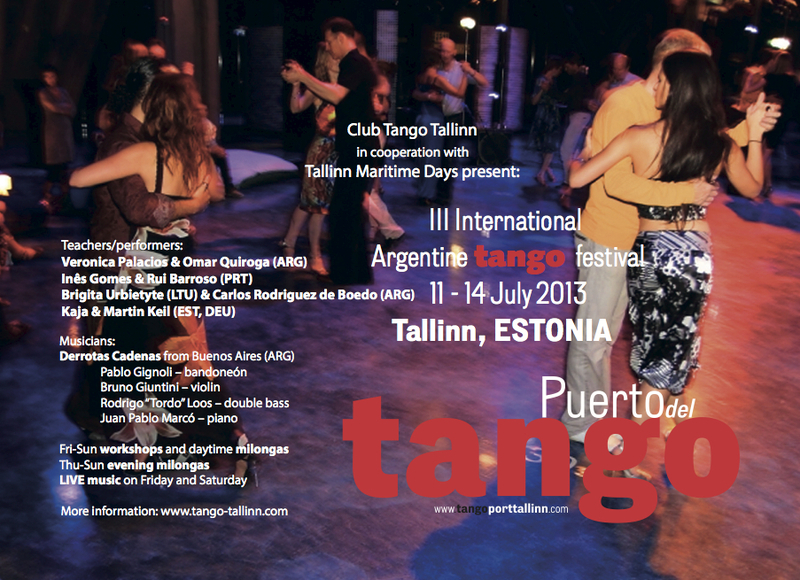 The festival is organised by NGO Tango Tallinn in cooperation with Tallinn Maritime Days. This year the dancers of classical tango and tango nuevo can meet to have lessons and milongas with live music and world famous tango performers and teachers such as Veronica Palacios & Omar Quiroga (Argentina), Brigita Urbietyte (Lithuania) & Carlos Rodriguez de Boedo (Argentina) and two wonderful couples who pleased us with their presence also at Tango Port Tallinn 2012 – Inês Gomes & Rui Barroso (Portugal) and Kaja & Martin Keil (Estonia, Germany). Live music will be played during Friday and Saturday concert-milongas. The artists include a quartet Derrotas Cadenas from from Argentina as well as young Estonian musicians. Cenas ir norādītas par vienu nodarbību un no vienas personas. * ja jūs piedalaties vairāk kā 4 nodarbībās, tad atlaide attiecas uz piekto un katru nākošo nodarbību. Piektdien 26. Aprīlī mēs kopā ar Sabrinu & Rubenu piedalīsimies tradicionālajā piektdienas milongā HiCentrā. Reģistrācija sūtot vēlamo nodarbību numurus un partnera vārdu + uzvārdu uz epastu: reinis@tangobaltica.org. Lūdzu reģistrējaties ar deju partneriem (ja nepieciešams, lūdzu izmantojiet mūsu partneru meklēšanas lapu). Esiet drosmīgi, tā strādā! Līdz šim esam atraduši partnerus visiem dejotājiem kas mūs uzrunāja pietiekoši laicīgi! Pēc jūsu pieteikuma saņemšanas jūs saņemsiet maksājuma uzdevumu un pēc tā apmaksas jūsu reģistrācija būs apstiprināta. The prices given are per one lesson per one person. *If you take more than 4 workshops (any), then the reduced rate applies for 5th and each next workshop. On Friday, 26 April we will join with Sabrina & Ruben the traditional Friday’s Milonga at HiCentrs. Please register with a partner (approach our partner search function if needed). Be couraged, it works! So far we found partners for all dancers that approached us early enough! After registration you will receive a payment request and after transferring (or handing over) the fee, your registration is valid. engaged in a dance to strike the right balance. Ilona’s famous Ladies technique “Relaxed walking, cross and small adornos; tips for the own axis and straightening and for correct placing of foot and leg. Tango technique for COUPLES “Going into contact” – tips for a relaxed close embrace: how close embrace really works? For couples’ workshops WB registration in couples only. You are welcome to use the partner search option at http://tangobaltica.org/partner-search/ or apply to info@dancestar.lv. In your mail please indicate the workshop codes (for example: WA1) and your name and surname as well as name and surname of your partner. Payment must be made by bank transfer (or in cash upon agreement) beforehand to validate the reservation. Payment (bank) details will be sent to you after we receive your registration mail. with Ilona Rios available upon request and subject to availability on January 2 and January 3 between 10:00 and 17:00. Please, request at info@dancestar.lv. More information: – please, call +371 20227771. Ilona Rios, a professional in Tango Argentino from Monchengladbach, Germany, dances together with Salvador Rios and are well-known Maestros in Latvia – they have been participating in all Tango Sun Festivals since 2008. Besides this they have also been in Riga for different workshop weekends. They are well-known and beloved by our Tango dancers. Tango ladies in Latvia, for sure, will remember women class with Ilona and Gaia Pisauro from one of the previous Tango Sun Festival! Ilona and Salvador started to dance and teach tango together in 1998. Since 2008 Ilona uses her experience with Alexander-Technique in her tango lessons. It’s all about how to feel more comfortable in their way to dance and also in their body movements. Ilona started making her first dance steps in Ball-Room dancing, especially for Latin-Dances. Working for years in dancing Schools, she got a lot of pedagogical experience how to teach in a clear and good didactical way. Her teachers were Ruben Terbalca, Gustavo Naveira, Sergio Molini and Gisela Graef Moreno, Eric Mullerand Jeusa Vasconcelos. for your information – in the teachers workshop “most important aspects in teaching milonga” with Salvador Rios, that will take place as part of Todo Milonga workshop weekend, the milonga will be discussed as an independent dance and a lot of solo exercises will be performed. For this workshop you can register without a dancing partner, by sending email to reinis@tangobaltica.org. jūsu informācijai – skolotāju nodarbībā “svarīgākie aspekti mācot milongu”, ko vadīs Salvadors Rioss nodarbību nedēļas nogales Todo Milonga ietvaros, milonga tiks apskatīta kā patstāvīga deja un nodarbībā tiks veikti daudzi solo vingrinājumi. Šai nodarbībai var reģistrēties (sūtot epastu uz reinis@tangobaltica.org) bez deju partnera. WS2b Women technique Milonga – discover the world of rhythmic ornaments! 13:00 – 14:30 WS5 Forward Ocho in the Milonga: without Pivots, small but cheeky! Registration by e-mail to: reinis@tangobaltica.org. In your mail please indicate the workshop codes (for example: WS3) and your name and surname as well as name and surname of your partner. Vēstulē lūdzu norādiet nodarbības kodu (piemēram, WS3), jūsu vārdu un uzvārdu kā arī jūsu partnera vārdu un uzvārdu. Jāveic iepriekšēja apmaksa caur bankas pārskaitījumu (vai skaidrā naudā sarunājot individuāli) lai apstiprinātu reģistrāciju. Maksājuma (bankas) rekvizīti tiks izsūtīti pēc jūsu pieteikšanās e-pasta saņemšanas. The long weekend starts and the last spiral circle of current tango year closes on December 28 in the club «El Naranjerito». The space of tango orangery will be filled with fresh and round orange smell, joyful faces and sprightly ronda. All together we will make the annual brilliant events top. For the first time in the Latvian tango history we will have the pleasure to enjoy live cortinas and of course the beautiful melodies of tango Golden Age epoch selected by charming DJ Ieva Drevina. Dress with taste, comfortably, with some round and orange accent and take with you some nice, small and round present which could be used for the lottery. Garā nedēļas nogale sāksies un tango spirāles kārtējā gada aplis noslēgsies īsi pēc pilnmēness iestāšanās 28. decembrī klubā «El Naranjerito». Tango oranžēriju piepildīs spirgts oranžu un apaļu citrusaugļu aromāts, laimīgas sejas un apaļa ronda. Pirmo reizi Latvijas milongu vēsturē dejotājus priecēs ne tikai DJ Ievas Drēviņas izvēlētās skaistākās zelta laikmeta tango melodijas, bet arī dzīvās cortinas. Vakara gaitā veidosim 2012. gada dzirkstošāko tango notikumu topu, spirdzināsimies ar vitaminizētiem dzērieniem un gardām uzkodām. Dress code: gaumīgs, ērts, apaļš, oranžīgs. Viesi lūgti ņemt līdzi kādu skaisti iesaiņotu apaļu nieku, kurš piedalīsies izlozē. Please write us at reinis@tangobaltica.org if you will come to this milonga, so the organizer knows how many guests to receive. Lūdzu rakstiet mums uz reinis@tangobaltica.org ja nāksiet uz šo milongu, lai organizētājs var atbilstoši sagatavoties ciemiņu uzņemšanai. We have a pleasure of inviting you to celebrate New Year together with friends and tango! Excellent tandas of classical tango by DJ Reinis, inspiring nuevo hour by DJ Ginta Opmane after midnight. Included – seat at a table, Midnight Champagne and appetisers. You are welcome to bring your own snacks according to your taste. Valters’ Buffet availabe for additional catering. Please register at reinis@tangobaltica.org. Advance registration: till Dec 21 – LVL 8 (EUR 11), from Dec 22. – LVL 10 (EUR 14). Mēs esam pagodināti ielūgt visus tango dejotājus pavadīt Veco Gadu un sagaidīt Jauno Gadu kopā ar draugiem un tango! Lieliskas klasiskā tango tandas no DJ Reinis un iedvesmojoša Nuevo stunda no DJ Ginta Opmane pēc pusnakts. Cenā iekļauts – vieta pie galdiņa, Jaungada šampanietis un nelielas uzkodas. Aicinām ņemt līdzi groziņu pēc saviem ieskatiem! Darbosies Valtera bufete. Dalība, iepriekš reģistrējoties: līdz 21.12. – LVL 8, no 22.12. – LVL 10.